These storage boxers are very sturdy and my albums fit in them perfectly. The lids clip on quite securely and that gives me confidence in how well these boxes are made. 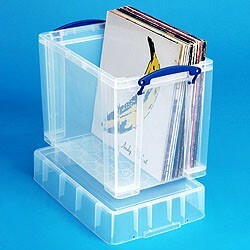 These boxes are great for storing LPs and keeping them clean and safe. Their size means they don't get too heavy to be easy to move, and they stack really well. They are tough and look good too. Not only are these 19XL boxes great for fifty LPs & 12 inch vinyl records, and stack on top of each other, but they also stack on top of the 9XL boxes which take 100x 7" vinyl.